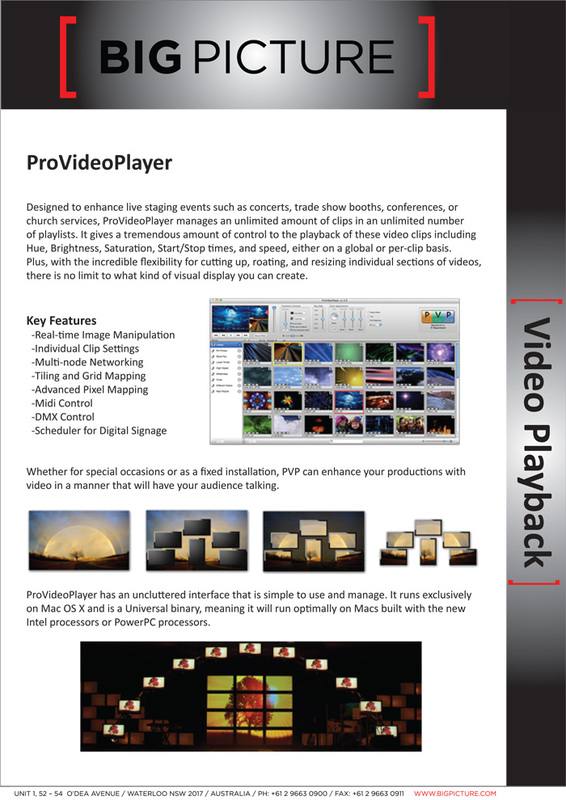 Designed to enhanced live staging events as concerts, trade show booths, conferences, or church services, ProVideoPlayer managers an unlimited amount of clips in an unlimited number of playlists. it gives a tremendous amount of control to te playback of these video clips including Hue, Brightness, Saturation, Start/Stop times, and speed, either on a global or per-clip basis. 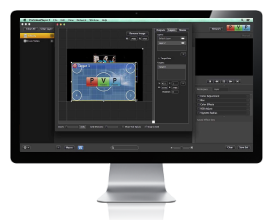 Plus, with the incredible flexibility for cutting up, roating, and resizing individual sections of videos, there is no limit to what kind of visual display you can create. Whether for special occasions or as a fixed installation, PVP can enhance your productions with video in a manner that will have your audience talking. ProVideoPlayer has an uncluttered interface that is simple to use and manage. It runs exclusively on Mac OS X and is a Universal binary, meaning it will run optimally on Macs built with the new Intel processors or PowerPC processors.